Is a bus driver permitted to refuse entry of children trolleys into the bus? Yes, in the event that the bus is crowded and there is not enough space. Yes, when there is no more space in the luggage compartment of the bus. The driver is always obliged to let children trolleys on the bus. Yes, but only when the trolley is designed to carry one baby (not when it is a trolley for twins). What is a special taxi ride? A ride under tariff 2 – holidays - plus 25%. A ride under tariff 1. Any ride on a route service. An exclusive taxi ride for the individual who ordered it. You are driving vehicle no. 3. 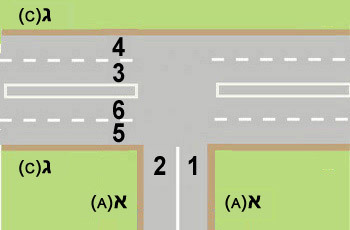 According to the rules of giving right-of-way, in what order should the vehicles enter the intersection? The cyclist (2), the blue vehicle (1), the vehicle you are driving (3). 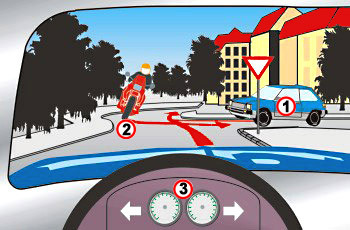 The vehicle you are driving (3), the motorcyclist (2), the blue vehicle (1). The vehicle that continues driving straight will go first into the intersection. The blue vehicle (1), the motorcyclist (2), the vehicle you are driving (3). Not if it is specifically indicated in the prescription or by the doctor. May be driven at a low speed of less than 40 Kmh. Is prohibited from carrying passengers. Is prohibited to be driven..
Is prohibited from carrying cargo. What is the certified “authority” for issuing bus operation permits? The Director of the Vehicle Department in the Ministry of Transportation. Is it permitted to drive downhill on neutral gear? It is allowed to shift to neutral gear while driving a public vehicle, a bus or a taxi downhill in a non-urban road only. It is absolutely forbidden. the gears must always be selected and operated . It is allowed to shift to neutral gear in any non-urban road which is moderately sloped, in order to save fuel. It is possible to drive in neutral gear in a moderate slope, where there is no risk of brake overheating, in order to save fuel. Is it permitted to park a vehicle within an intersection? It is permitted to park two-wheelers only. Yes, in an intersection of two lanes or more. No, unless parking is permitted by a traffic sign. It is permitted for no more than 5 minutes. Must hold an extra pair of eyeglasses or contact lenses at the taxi station. Must ensure that he carries on him a pair of eyeglasses or contact lenses while driving during the night. Must ensure that he carries on him a pair of eyeglasses or contact lenses while driving during the day. Must carry with him an extra pair of eyeglasses or contact lenses while driving. Whom should a taxi driver approach when his taxi meter malfunctions? A certified taxi-meter repair service provider. What should you do if a vehicle suddenly approaches you while you are being overtaken by another vehicle? Which changes in health condition must be reported to the Licensing Authority? Within which distance from a tunnel is it prohibited to overtake? Fifty meters before the entry to the tunnel and up to fifty meters after the exit from the tunnel. There is no overtaking restriction around a tunnel. 100 meters before the entry to the tunnel and up to 100 meters after the exit from the tunnel. From the entry until the exit of the tunnel. How should one refer to a pedestrian crossing that is divided by a traffic island? The pedestrian crossing should be considered as two separate crossings only when a garden separates between them. 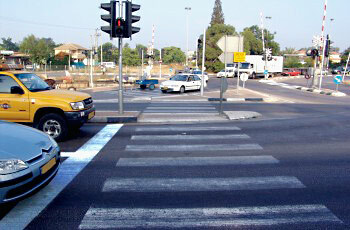 A pedestrian crossing that is divided by a separation area in regarded as one long crossing. There is no difference between a divided and a non-divided pedestrian crossing. They are both regarded as one crossing. A pedestrian crossing that is divided by a traffic island shall be regarded as two separate pedestrian crossings. Is it obligatory to obey the directions of a policeman who has identified himself with an appropriate certificate? No. you must only obey a traffic policeman who directs traffic in an intersection. Yes, even if his directions contradict those of a road sign. Yes, but only concerning traffic directions that are given within the intersection. When is a bus prohibited from crossing a railroad? When there is a “level crossing” warning sign. When there is no asphalt or cement road that leads to the level crossing, at a distance of at least 20 meters before the nearest track. When a “stop” sign is placed before the tracks. When a “right of way” sign is placed before the tracks. How frequently should a bus be disinfected? It must be disinfected shortly before its annual test. From lane 1 to lane 3. From lanes 1 or 2 to lane 3 or to lane 4. Only with the condition that the driver is guided by a person that stands behind the car and is visible to him. Only if the vehicle is close to the sidewalk. Provided it is necessary and that no risk, interruption or disturbance is caused to any other road-user. Driving in reverse is absolutely forbidden. Picking up or dropping off pupils on student transport is permitted:. From the rear door only. From the front right door only. From the front door and from the rear door. Picking up - from the front door. Dropping off – from the rear door. How should a driver conduct himself when noticing a “security vehicle”? Slow down, divert to the road’s right edge and continue driving normally. 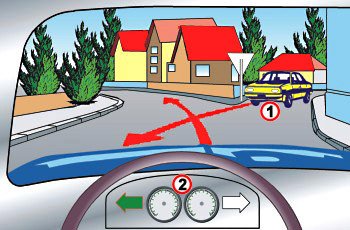 Divert his vehicle to the right, as close as possible to the road’s edge, give right-of-way and stop if necessary a distance from an intersection. Mount the sidewalk and stop there. 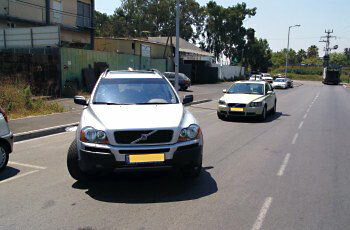 Drive closely behind the security vehicle and keep a constant distance of two seconds from it. Is permitted and not dangerous. Is forbidden and very dangerous. There is no legal reference to it. Is a bus driver required to hold in the vehicle an extra pair of glasses / contact lenses? Yes, even if he is not the acting driver at that time. Yes, every driver of a commercial vehicle must hold an extra pair, even when he doesn’t carry any passengers. Yes, every acting driver of a commercial vehicle that carries up to 6 passengers must hold an extra pair. In the following illustration you can see a wide road. 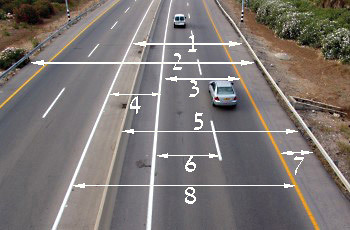 Which of the numbers within the illustration marks a road way?